Entryways are the first thing you see, not to mention the first thing your guests see (you know what they say about first impressions!) Even though they are a small space its an opportunity to make a huge difference. 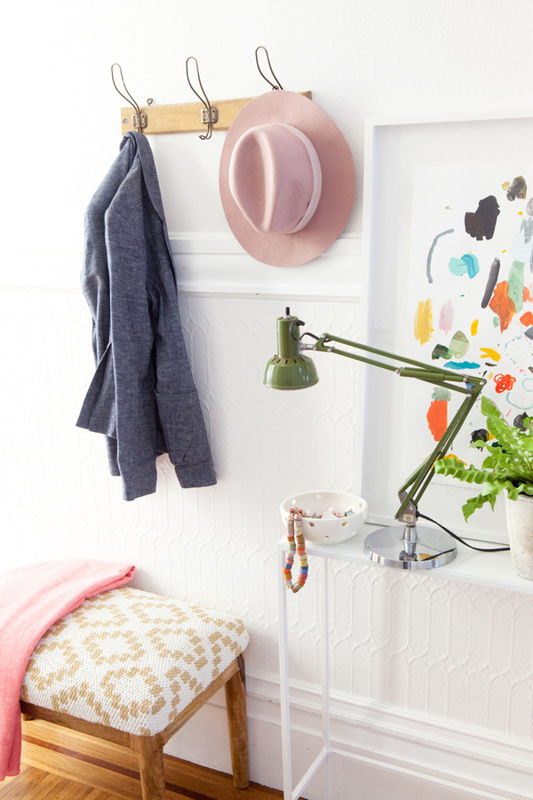 I love small decorating projects like an entryway. 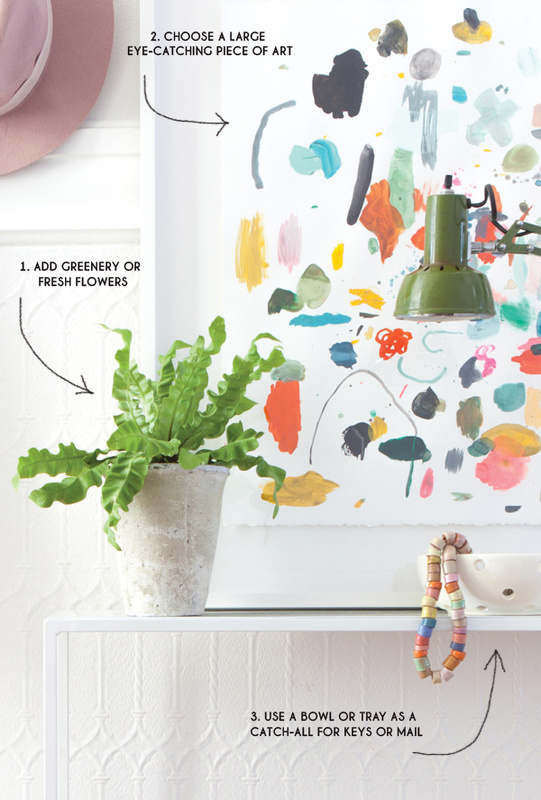 You can give it a little refresh with not much effort or money and it goes a long way. 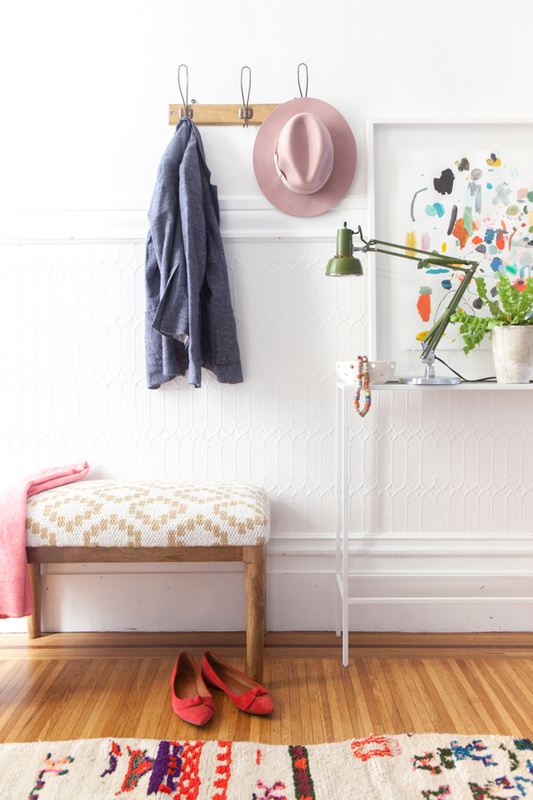 Here are four tips for putting together a modern entryway. 1. Add Plants or Flowers. I don’t know much about feng shui but I know that the moment I put a plant or fresh flowers in a space it adds a breath of fresh air, it livens the space right up. 2. Make something the Star Attraction. Here we made the art big and colorful! It is the first thing that catches your eye when you enter. 3. Trays and Catchalls and Bowls Oh My! These make great clutter collectors for keys and mail so your space stays nice and organized. 4. Make it Functional. We added this pretty bench from Target for a place to sit and take shoes on and off as well this coatrack to corral jackets and backpacks when you enter. Pretty! Can you let me know where the rug is from? Thx! Yes! The rug is vintage from Morocco. It’s my favorite! From where is that coat rack? Such a cute style and perfect, difficult to find size! It is vintage! I just added sources above. Love how fun this looks! I will defiantly take your advice about the plants! Very pretty! I definitely agree. Plants especially seem to make a huge impact. Hi! Where did you get that colorful print? Its lovely! so bright and fun! we just bought a house and I’ve been pinning ideas for our entryway – this is definitely on the list! 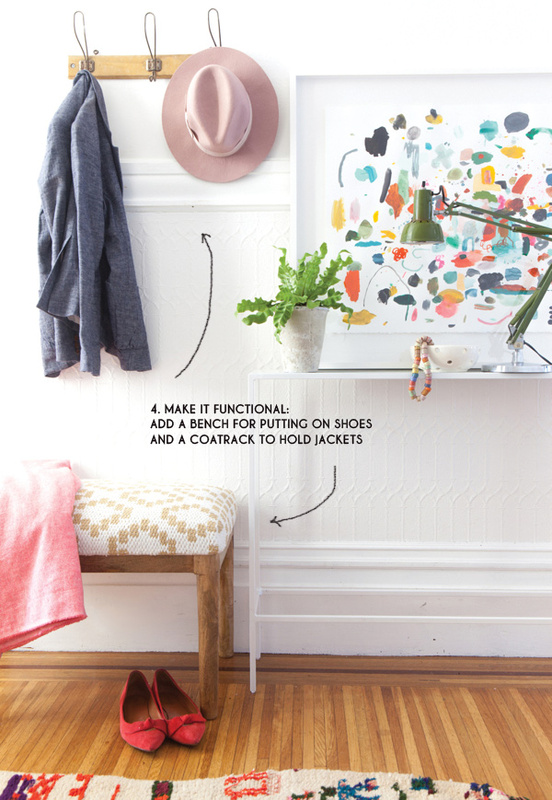 I bought a bench for our entryway this week, so this post was very helpful. Right now it’s just a space for our ironing board etc, but I want to make it look good. Jordan, where is the elegant, spare entry table from? From Room and Board! All the links are at the end of the post! any good recommendations for fake plants/flowers? My only recommendation is to don’t use fake plants and flowers. 😉 They are much more work to take care of but so much more beautiful! Looks beautiful and functional! Where is the hat from? Thanks!